his week we change gears at the CashFlowGuys Podcast. We bring on a returning guest who has provided tons of value to our listeners in the two previous episodes she recorded with Tyler. Today, the “value bar” is raised to a whole new level. As we have discussed on the podcast before, fear is something that can often cripple an investor. Fear evolves from our learned behavior of how we react to mistakes or negative experiences that occur in life. 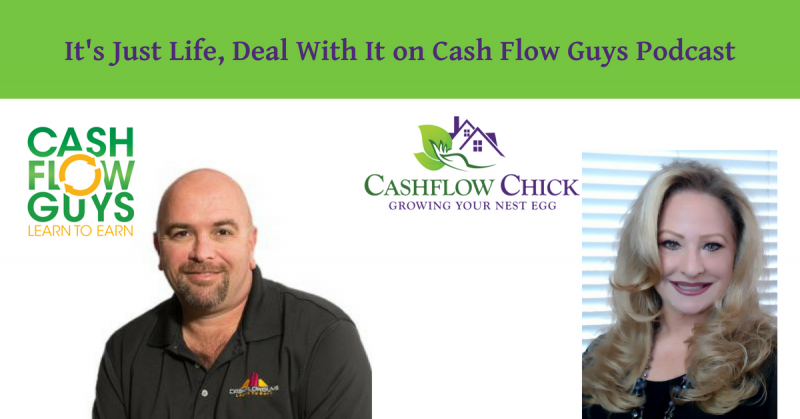 Paige Panzarello aka “The CashFlow Chick” returns to the show to discuss the trials and tribulations that have helped mold who she is today. Paige began her career in real estate by inheriting (yes, inheriting) 38 townhomes due to a death in the family. At the time she inherited these properties, she had no landlording experience whatsoever…but she dove in, head first and learned the ropes. That little adventure lead to Paige accomplishing many great feats, and also resulted in some unfortunate situations that provided a mold for the Paige we now know. Paige digs deep in the episode and helps us learn about the sequence of events and experiences that have molded her eventual success. We also learn that whatever problems may arise, we can and will overcome them and then grow from the experience. As investors, many people blindly follow the masses by investing in “household name” investments such as stocks, bonds and mutual funds. Part of the problem with that is that many of these investments are not fully understood by the investor…and that is a problem.